If you happen to be reading this, let me ask you a personal question do you consider yourself to be a average,good, great, outstanding or an above average man or woman? Or are you just a person trying just trying to do their best to learn from their mistakes and get better or perfect their craft? For those who are caught off guard by my questions, let me explain. 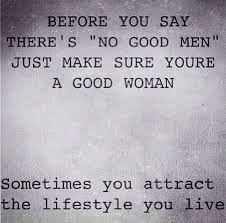 Its been wildly rumored that there are no good available or quality men. That all or most of the good men are dead, buried, gay, in jail or lost with time. I have heard many women make this statement or ask these questions ; "They don't make men like my father, grandfather or late great grandfather anymore. Where are all the Gentlemen , God fearing men, hard working men that aren't childish, drug addicts, thugs or want to be gangsters that aren't playing childish games? Where can I find a man that will love me, spoil me and treat me like a queen? Where are the men, that won't try to use me for my body, drain my bank account, ruin my credit or one that I wouldn't have to bail out of jail? Where can I find a loyal man that won't cheat on me or one that I can trust around my children and my female friends? And finally where can I find a man that I can work with instead of having one working against me? One that I don't have to argue or fight with and a man that's not abusive, mean or jealous ? Ladies if you really want to know the answer to these questions, I am sorry or proud to say that there are good men every where and some may happen to be right under your noses. But I am also sorry to say that your chances of getting to know one or meet one of these very good men are slim to none. Why you may ask? Because just like you they are very bitter, been through a lot, divorced, hurt, lied to, cheated on, bank accounts drained, hearts broken, credit ruined, talked about like a dog behind his back and their faith or trust in women in some cases have been crushed, then shattered forever. If what you read isn't enough the fact is after a breakup or divorce most men have to rebuild or start their lives all over again. The difference is that when a man give his heart to a woman he loves and then she crushes it, he then becomes less giving or willing to trust again. Also most men aren't willing to give someone new their heart, love or their all, because they are afraid of getting hurt again .Does that mean that these men are giving up looking or searching for a good woman? No because men aren't built that way, the fact is that most of us move very quickly hoping that one day we will find our perfect match or queen and the fact is that if they have been hurt in your area or by their own race then they are most likely looking some where else or outside of their race. Does any of these thoughts sound familiar ladies? Yes, all men have feelings and even though some of us may seem arrogant, emotionless, strong, tough or self centered all men have the desire to be loved. What you just read is the thoughts, feelings or The Insides Of A Broken Good Man. Write in then express your thoughts or feelings on the subject.